The Company of Ian Scott-Taylor Golf Architect is known for its historical restoration and design of golf courses in the golf world. From golf course renovations encompassing complete courses, to hole renovations and design of individual tees, fairways, bunkers and green projects. We also design practice facilities, golf schools, and short game areas. Restoration work is a key part of our practice. 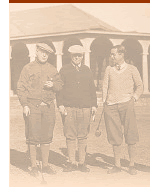 We have been privileged to work on some of the great courses by Willie Park Jr, Donald Ross, James Braid, Gene Hamm, and Joe Lee, producing integral updates with great acclaim. When we design practice facilities we do so to a high specification, enabling strong teaching values from the results. Many are designed to the requirements of Tournament Golf, with the exacting chipping and auxiliary needs they require. Putting greens, short game areas are also our specialties. We understands the importance of the short game, on both sides of the Atlantic Ocean, in the United States and the home of golf – the United Kingdom. We have a reputation for personal service and exceptional golf course design. With our inspirations based in the ‘golden age of golf’ by the great work of Alister MacKenzie, Donald Ross and A.W.Tillinghast. Call today and discuss you next project with us. Ian Scott-Taylor’s golf architectural career has spanned twenty years to include involvement with or leading over fifty major design projects throughout sixteen countries. Scott-Taylor’s belief in classic strategic golf traces back to his early years in North Wales, in the United Kingdom. His father, an officer in the merchant navy also contributed to his love of the game. He studied at West Glamorgan Institute of Higher Education, City and Guilds London Institute and the University of Wiltshire, where he received his Ph.D in Engineering Design. At the Royal Commission of Ancient and Historic Monuments, Scott-Taylor worked on some of the most environmentally sensitive sites in the UK. He became an expert on historic landscapes and site recognition and remains one of the only golf course architects in the British Isles to work on heritage and ecological issues for the British Government. In 1985 Scott-Taylor joined the David Williams Partnership. In his position with other notable golf course designers, he developed his skills and gained a reputation for precision scheme and working drawings. In 1991 he opened his own practice and worked with David Feherty, Brian Huggett, and Ian Woosnam on numerous sites. With Wales as his home base, projects took him to Turkey, Dubai, Ireland and the USA. Scott-Taylor came to the USA in 1998 to create a championship style British golf course on the Eastern Shore of Maryland. The result... Hunters Oak Golf Club, Queenstown, MD. During the project, he spoke to his father often about their mutual respect for the game and the land on which it was played. After completion, he remained in the US. Scott-Taylor sees a special need for accurate restoration of classic courses and environmentally sensitive solutions for course improvement and expansion. His goal is to build courses that will become the timeless standard of the game. Bill comes to the golf business with nearly 40 years of experience in project management and accounting. He began his career with Ernst and Young in New York, had his own capital management firm, spent several years in the health care industry and is a CPA in the state of New York. A graduate a Georgetown University, Bill also holds an MBA from the Columbia University Graduate School of Business. Contract administration and strategic planning are Bill’s areas of expertise.